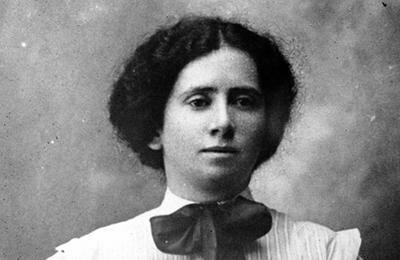 Rose Schneiderman (April 6, 1882 – August 11, 1972) was a prominent United States labor union leader, socialist, and feminist of the first part of the twentieth century. She is credited with coining the phrase “Bread and Roses”, later used as the title of a poem and set to music and interpreted by several performers. Rose Schneiderman was the first of four children of a religious Jewish family, in the village of Sawin, in Russian Poland. Her parents, worked in the sewing trades. In 1890 the family migrated to New York City’s Lower East Side. Schneiderman’s father died in the winter of 1892, leaving the family in poverty. Her mother worked as a seamstress, trying to keep the family together, but the financial strain forced her to put her children in a Jewish orphanage for some time. Schneiderman left school in 1895 after the sixth grade, although she would have liked to continue her education. She went to work, starting as a cashier in a department store and then in 1898 as a lining stitcher in a cap factory in the Lower East Side. In 1903 she started organizing the women in her factory. Schneiderman obtained wider recognition during a citywide capmakers’ strike in 1905. She quickly became one of the most prominent members of the New York Women’s Trade Union League (WTUL), elected the New York branch’s vice president in 1908. She left the factory to work for the league, attending school with a stipend provided by one of the League’s wealthy supporters. She was an active participant in the Uprising of the 20,000, the massive strike of shirtwaist workers in New York City led by the International Ladies’ Garment Workers’ Union in 1909. She also was a key member of the first International Congress of Working Women of 1919, which aimed to address women’s working conditions at the First annual International Labour Organization Convention. Schneiderman was a founding member of the American Civil Liberties Union, and became friends with Eleanor Roosevelt and her husband, Franklin D. Roosevelt. In 1926, she was elected president of the National WTUL, a post she retained until her retirement. In 1933, she was the only woman to be appointed on the National Recovery Administration’s Labor Advisory Board by President Roosevelt, and was a member of Roosevelt’s “brain trust” during that decade. From 1937 to 1944 she was secretary of labor for New York State, and campaigned for the extension of social security to domestic workers and for equal pay for female workers. During the late 1930s and early 1940s, she was involved in efforts to rescue European Jews, but could only rescue a small number. Schneiderman never married, and treated her nieces and nephews as if they were her own children. Rose Schneiderman died in New York City on August 11, 1972, at age ninety.